Step 1. 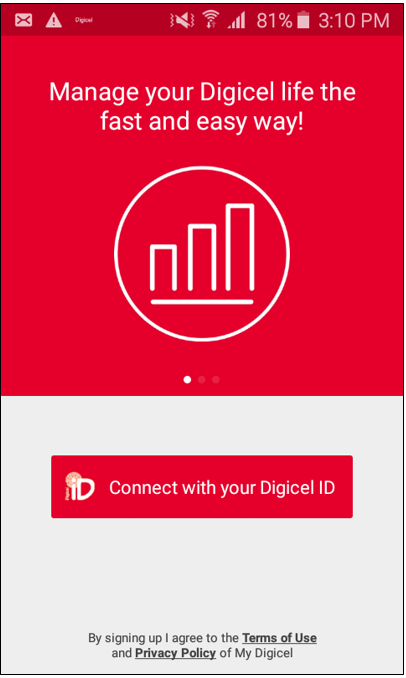 Click on ‘Connect with your Digicel ID’. Step 2. Your main account balance *120# will be shown on the ‘Home’ screen. Step 3. Select the ‘Menu’ button ( ) at the top left-hand corner of the app. Step 4. Select ‘Account & Balances’. This will display the balances for any plans or bonus credit on your account. Step 2. You will see another menu where you have to reply by 1 to see the balance of your main account as well DigiAdvance, Internet and Option Plus . *120# is the first way to check your balance. In the beginning, you should see some information on our products and services.